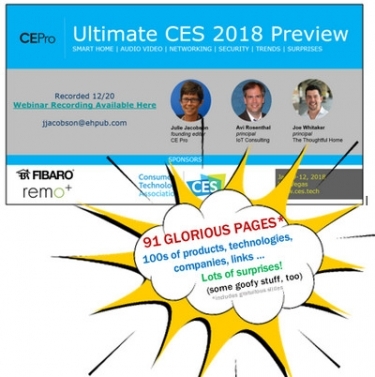 CE Pro's Julie Jacobson presents the Ultimate Preview of CES 2018 in 91 pages of Powerpoint slides, with products, trends, links and insights on home automation, A/V, IoT, energy, lighting, AI, security, networking and related smart-home categories. CES 2018 will be bigger than ever, and you might need a little help navigating the enormous event. Once again, we present the "Ultimate Preview" with 91 pages of smart-home trends, new products and insights. The Powerpoint presentation adds substantially more technologies, pages and links than the Dec. 20 Webinar that started it all. The Webinar, which includes color commentary from myself, as well as industry veterans Avi Rosenthal and Joe Whitaker, is available for review. We cover a huge range of product categories including audio and video, but the bulk of the content here relates to the smart home and subcategories including lighting, security, IoT, networking, wellness, AI, home automation standards, cybersecurity, energy management and more. We keep it lively with some of the more interesting discoveries as well. For the first time, we created a "sight unseen" award for products and technologies that look amazing on paper. I alone am to blame for those "honors" because, as we know all too well, things are never the same as they appear online, and most new products never make it to market. CE Pro thanks CES producer Consumer Technology Association, as well as CTA's TechHome Division, for sponsoring this presentation. We also appreciate IoT providers Fibaro and remo+ for their support. Below the slideshare is the raw text of the presentation, making it simple to search for specific companies or technologies. Please keep us posted on your CES and other home-technology news. You can follow our coverage at www.cepro.com/ces. 13. Smart Home 75% of connected-home devices are purchased through service providers today, due to strong go-to-market access. McKinsey & Co.
18. Cloud to Fog (Edge) • Ring ▻ Ring Protect - ZigBee, Z-Wave (post-ADT lawsuit) • Wink 2 ▻ more local processing • Google Home ▻ Google Home Max with Nest Weave? • Nest ▻ Nest Secure with Thread/Weave • Nest IQ Cam ▻ More processing locally • Amazon Echo ▻ Echo Plus – ZigBee SMART HOME FUN FACT: ‘The Cloud’ was a CEPro Top 5 Trend in 2012. 41. Non-invasive video analytics (computer vision) SMART HOME • Less is more – Before: Cameras showed more – Now: Cameras show less, reveal more – Images processed locally for analytics, not shared • Examples – Thermal imaging – Spatial analytics – disruption of RF waves, light, pixels – Facial analysis, mood recognition • Use cases – Seniors: changes in activity, gait, other behaviors – Recognize unknown people, gestures, facial expressions – Capture, analyze activity not seen by the naked eye FLIR Thermal imaging can detect people, water leaks, drafts, critters, other ‘invisible’ activity. 45. Audio Analytics / Voice Extraction • Recognize specific sounds – Baby crying, gunshot, smoke detector siren • Isolate and layer sounds – Hearables - Bragi with Audio Analytic; Orfeo with InnerMic – Intelligent conversation detection, voice extraction – Applications for voice control – Examples: OnVocal, Stages, Alango, Cypher (Cirrus) ❌, Doppler Labs ❌ • Learn sounds and patterns, anomalies – Subsonic (low frequency) – Cocoon ❌ – Ultrasonic (high frequency) – Lisnr / Cerevo – Example: Mitipi • AI example: Vivint front-door listening patent COCOON LISNR (CEREVO) SMART HOME / SECURITY AUDIO ANALYTIC ai3 sound recognition software + Bragi wireless Dash Pro recognizes conversations, changes volume and external sound transparency. 47. Water – Leak detection, water shut-off, conservation SMART HOME / SECURITY Leak Detection at CES Flo Technologies • Analytics + water shut-off Guardian by Elexa • Sensors + non-invasive water shut-off: Torques valve when leak detected; Z-Wave, Wi-Fi Conservation Labs H2know • Analytics for conservation StreamLabs • Analytics + water shut-off Robeau • Flow meter installs at taps – LoRa Buoy Labs • Analytics + water shut-off FlowBox • Analytics + water shut-off, primarily for property management Wally Home ❌ • Analytics + water shut-off; adds humidity & temperature sensors for AI; spikes could signal mold conditions; Wally Rapid Response monitoring service, can triage and send techs. ROBEAU GUARDIAN BY ELEXA can switch off water if leak is detected by indoor water sensors ENOCEAN energy-harvesting water sensor needs no batteries. Liquid spills onto a piece of cork, which begins to expand, generating enough energy to fire off one quick RF message. 54. IT / Physical Security Convergence • New paradigm in corporate security – Convergence of physical security (people and property) and digital security (data and privacy) – Blends security director with CIO, CTO, CISO – Strategic, risk mitigation • Securifi Almond Guard ❌ – Home automation, smart home, cybersecurity in one – Intelligent arming & disarming – Monitoring, diagnostics for network & connected devices SMART HOME / SECURITY SECURIFI Almond Guard protects against both physical and digital threats. Why aren’t the major home- security mfrs doing this? ❌ MORE ON CYBER Skip ahead for more on networking & cybersecurity. 72. Audio Trends • Wireless – multiroom • Wireless - multichannel • Immersive audio (object oriented) – MPEG-H 3D Audio – Dolby Atmos (invite only) – DTS:X (under Xperi) – Auro 3D ❌ • High-resolution audio (HRA) – Content, products • High performance audio AUDIO FRAUNHOFER Reference design of MPEG-H enabled immersive soundbar. MPEG-H Audio launched in S. Korea with 4K TV broadcasts over ATSC 3.0. LG has licensed. 75. Video MORE ON VIDEO @ CES: More talk, less ppt in the Webinar. 85. Opportunities? “Jean Nouvel, the creator of the Philharmonie de Paris, is undeniably the most important and distinctive of all French contemporary architects. ” GARAGE SMART (Hall Labs) Who wouldn’t want this? 90. Parting Words That’s a relief.